Rupert Murdoch, seen at Sunday's Golden Globe Awards, went to bat for his companies on Twitter in the battle against Internet piracy. Rupert Murdoch didn't waste any time using his newfound popularity on Twitter to make waves and take shots at some other major names. His targets? President Barack Obama and Google. The media mogul took aim at the president and the leading Internet search engine after the White House announced over the weekend that it would not support legislation mandating changes to Internet infrastructure to fight online copyright and trademark infringement. The White House statement came in response to two petitions circulating on the Internet as well as widespread comments across the Web about the dangers of the legislation. A major online backlash has developed regarding the Stop Online Piracy Act, with everyone from lawmakers to Web freedom advocates to some of technology's biggest players calling it a greedy and dangerous overreach that could have a chilling effect on free speech and innovation. Google, Yahoo and Facebook are among the Web heavyweights who have joined the chorus against SOPA, which backers hope to have ready for a vote by the end of the year. 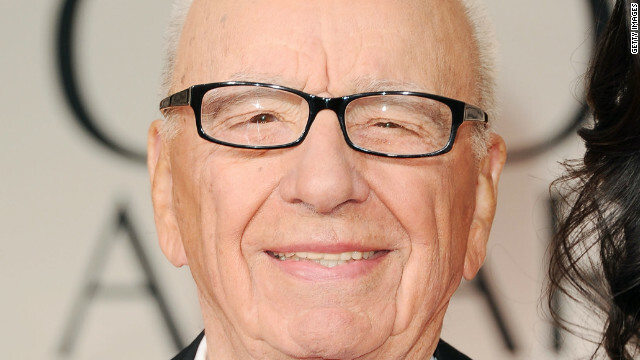 The combination of Google and Obama attacking the bill clearly didn't make Murdoch happy. He began unleashing his frustration on Twitter by attacking Obama's relationship with so-called "Silicon Valley paymasters." Naturally, Murdoch has a dog in the SOPA fight too - his massive media empire. No doubt he doesn't care for all the websites where users can watch and download episodes of his company's TV shows and movies without ever subscribing or paying. And clearly he isn't happy that all of this is out there. It means a loss of money for him and his advertisers. And for that, Murdoch squarely blames Google. Piracy leader is Google who streams movies free, sells advts around them. No wonder pouring millions into lobbying. For his remarks, Murdoch took a bit of a beating on Twitter, where most people are advocates of an open Web without government control. Some users argued he was outdated in his thinking and were quick to point out that Google has done a lot to help the media. Some said it was foolish to criticize a search engine for having links available in its search. Users swung back at Murdoch that you can't complain about what a search engine's results turn up. So Murdoch changed his tactic a bit, trying to humanize the issue. For many users on Twitter, that didn't go over well either. Now, thousands of people tweeted, all of a sudden Murdoch was coming to the aid of the little guy? So Rupert, still in his tweeting infancy, wanted to make clear he didn't have only bad things to say about Google. Understand more than all allege! Google great company doing many exciting things. Only one complaint, and it's important. That was, apparently, until he went back to the search engine and took a look at what was out there for the new "Mission Impossible" film. He saw the results as evidence that his anger toward Google was warranted. He then admitted that while he may not understand completely all details and nuances of the fight and Google's role, he did know enough to know he didn't like what he saw. So what did the search engine giant think of the media mogul's Twitter allegations? A representative told CNET it was "nonsense." "Last year we took down 5 million infringing Web pages from our search results and invested more than $60 million in the fight against bad ads. ... We fight pirates and counterfeiters every day," the spokeswoman told CNET. Murdoch never quite clarified whether he'd like the search engine to do more to take those links down, or if he perhaps wished companies like his could play more of a role in asking for something to be taken down if it infringed upon their copyright. But his fight continued, culminating at perhaps the perfect time: the day of the Golden Globes. As fans tweeted their thoughts on who was going to win and shared their excitement to see the best of the best in the industry, Murdoch turned back to those very people to show that piracy was a real danger to Hollywood. Golden Globes great night for whole creative tam at Fox. Congrats! Best pic Descendants, best tv show Modern Family and many other wins. More pirates. Whole entertainment ind employs 2.2 million ave salary 65 g. Good jobs and expanding foreign earnings. Made in America, too! He ended with a shot at Obama, asking why he would align himself with the "pirates" who help push illegal content online. (Murdoch later clarified that in this tweet he had an autocorrect issue on his iPad and had clearly meant to reference POTUS, the president of the United States, instead of the name of an Australian company. Seems like universal anger with Optus from all sorts of normal supporters. Maybe backing pirates a rare miscalculation by friend Axelrod. Tremendous things here. I am very glad to peer your article. Thanks so much and I'm having a look ahead to touch you. Will you kindly drop me a e-mail?